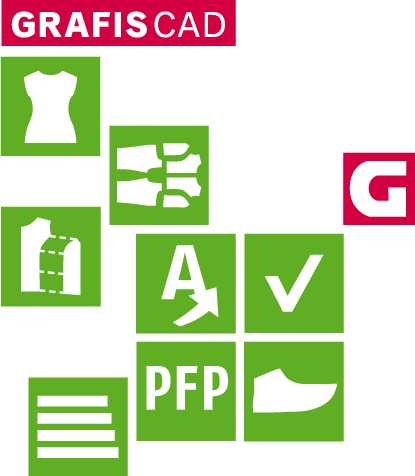 With the GRAFIS CAD software you have an innovative software for construction of clothing and technical textiles at your fingertips. Thus, you combine traditional operations for generating professional patterns for the clothing industry with the advantages of digital, effective and intuitive processes. With GRAFIS clothing construction, unlike other CAD systems, you have the advantage of the construction principle. Each step is documented in a construction record and can be utilised again and again with different measurement charts (body measurements or finished measurements) to give you maximum control over your style development. Therefore, as a rule, grading in GRAFIS is not carried out as standard grade rule grading but as a new calculation of the entire construction. Grading ensues automatically based on measurement charts. But, of course, we do not take away your freedom to actively grade according to your requirements through break-size dependent adjustment. Thus, the style is entirely in your hands. If you want to grade finished patterns from other systems or digitised pattern pieces, you do not have to abandon grade rules. As an alternative to grading via the construction record, you have the option to work traditionally with grade rules at grade points. GRAFIS automatically creates interdependencies between pattern pieces. Alteration to the development part automatically leads to adjustment of the dependent pattern pieces. Thus, no quality-reducing differences in seam length occur, no matter how unusual the pattern is. These interdependencies also offer you fast and effective creation of style variations. You also have the advantage of being able to create your styles based on the interactive basic constructions. These can be easily adjusted interactively or via value entry and offer a large variety of possibilities for fit optimisation and style modification. New interactive constructions are constantly being developed for the standard area of the clothing industry as well as specialised areas such as underwear and accessories. Your style development is accessible to you at all times, even after completion. Subsequent corrections or modifications of the style development are possible via the adjustment of parameters. The new part assistant speeds up the completion of your pattern pieces by guiding you through all important areas of generating a production pattern. Nothing will be forgotten and adding seam allowances, symbols, annotations, corner treatments and similar will only take a few seconds of your valuable time. For data exchange with a number of other CAD systems, the import and export interfaces integrated in GRAFIS are at your disposal, ensuring that you can work with production sites or freelancers without any problems.